Avoid clones for a better grow. There are massive differences between growing from clones and cannabis seeds. Clones are cuttings taken from a cannabis plant. You put the cutting into a rooting substance so it develops roots. When it grows into a mature plant, it’s the exact genetic copy of the plant it came from, but weaker genetically each copy and by the age of the donor plant. Commercial growers will have larger harvests from seeds and lower utility costs. They will get their best bang for their buck while keeping their costs down to keep competitive on the wholesale cannabis market. Though initial costs for seeds may be higher than from clones, once harvested, the extra yield will make the initial costs worthwhile. Craft growers want to produce finer quality strains. They’re usually hobbyist that can devote much time and efforts to growing and making a perfect new strain. There’s no way they would want to pass along week genetics from clones. These die hard craft growers use only the finest seeds for their breeding programs. Avoid clones for a better grow and give back to the cannabis community. Growing from clones weakens the overall cannabis gene pool. Let’s make the world a greener place and give back by growing only the best cannabis genetics from seed. The cannabis gold will approve and return you good karma for the rest of your days. You’ll also be smoking better herb. BC Seeds is considered the leader in cannabis genome research. You can get good karma from the cannabis gods by growing up their genetics. You may also get hooked to breeding like so many first time growers. It important to start growing using the best cannabis seed stock money can buy. 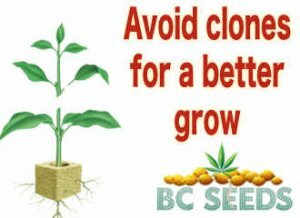 Avoid clones for a better grow and get Dutch Seeds and BC Seeds. They’re both top choices when it comes to the best cannabis genetics. Home breeding as a hobby is very rewarding and therapeutic. It’s great speding time with plants. It will destress your stressful lifestyle.